Trivae is a Gadgeteer worthy trivet. Wait, what? If you enjoy cooking, then you can probably relate to this scenario. You’re making a pot of soup, boiling pasta, tomato sauce, etc. and you need to put the pot lid down so you can stir or serve the food. If you place the lid “face down” on your stove or countertop, the condensation that built up from the steam in the pot will drip onto the surface, making a mess that you’ll need to clean up later. Trivae has been designed to solve this problem. 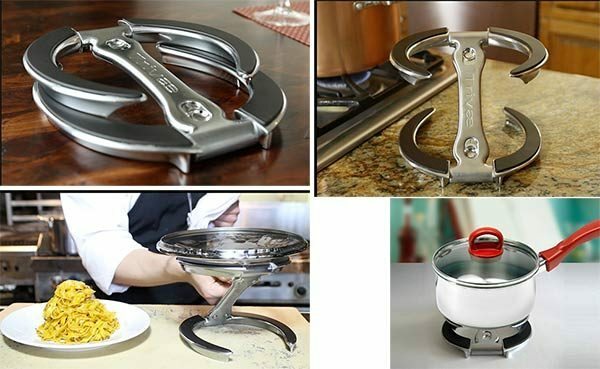 It’s an over-engineered trivet that can keep one or even two hot pots from damaging a countertop and it can also fold into a z-shape to convert into a handy pot lid holder. 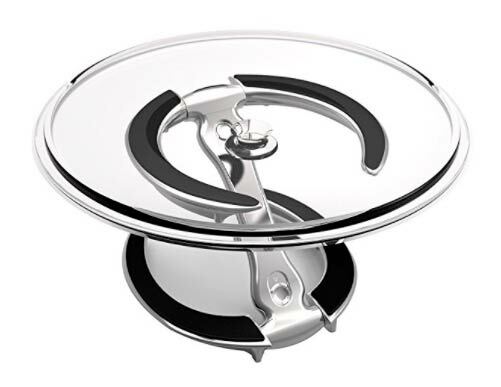 In this configuration, the Trivae trivet can hold upside down lids or even elevated platters of food. Don’t worry, it won’t collapse under the weight of your homemade meat lover’s pizza because it’s strong enough to hold up to 10 pounds. Trivae is available in four colors and is priced at $80. You can read more about it at Trivae.com and order from The Grommet or Amazon.